9.Pompa do przetłaczania ropy typ ” Drapper”. Pompa do przetłaczania ropy typ „Drapper”. Pompa tłokowa z początkowych lat rozwoju kopalni. Była napędzana za pośrednictwem transmisji linowej z kieratu do grupowego pompowania ropy. 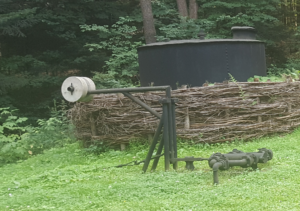 “Drapper” pump used to pump over crude oil. 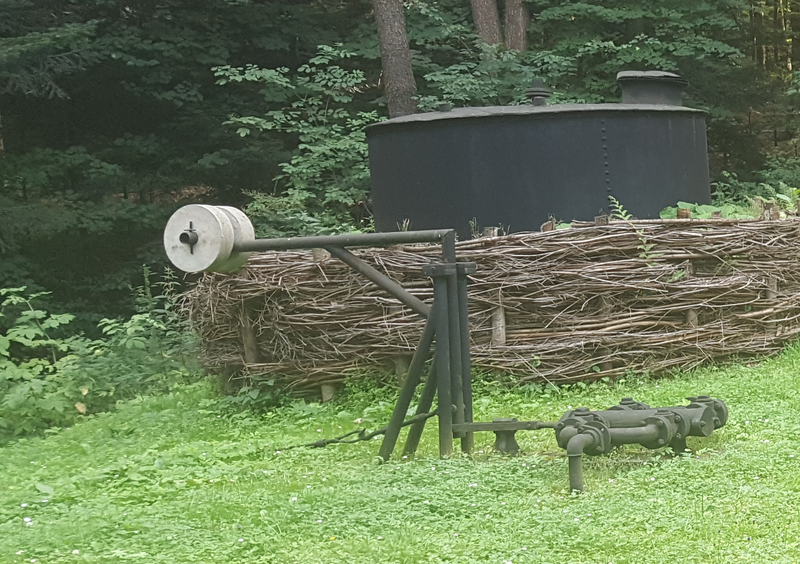 A piston pump from the beginnings of the oil field development. It was driven by rope transmission from a “treadmill”, which drove a group of pump jacks or nodding donkeys (in fact it was not a classical treadmill but a combination of eccentric mechanism and wheel and axle machine with a number of slave wheels, driven by jerklines, transmitting drive to a group of pumps). Pumpe zur Erdölförderung, Typ „Drapper“. Kolbenpumpe aus der Anfangszeit der Entwicklung des Bergwerkes. Die Pumpe wurde über den Seiltrieb aus dem Göpel zum Gruppenpumpen angetrieben.